I have had to top my basil twice already and it needs it again. It is going crazy out there... but that means fresh pesto time!! 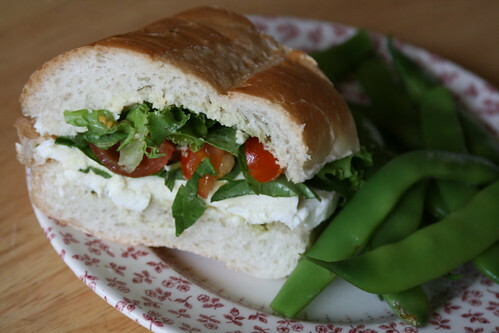 I make mine with raw almonds when the pine nuts are too spendy (which they are right now) and then for a treat, I make a pesto & fresh mozzarella sandwich. Then you need fresh mozzarella. Trader Joe's has it already sliced, but I get mine in the loaves so I can use it for my pasta salad as well (which funny enough, has all the same important ingredients). To assemble, put the mayo on the bread and then put a bit of pesto right over top of the spread mayo. Mixing is encouraged. Then put the moz slices, tomato slices, lettuce, and basil. Then do sandwich stuff... fold, slice, and put on plate, etc. I sided mine with freshly blanched Roma beans (which get sweeter and more tender just after blanching and cooling). In my personal opinion it was way better than chips. My family opted for the chips though. This is my August entry for the Grow Your Own challenge. The tomatoes and basil came from my own garden (my first cherry tomatoes!). The lettuce and the Roma beans are from the farm I work for. If you are interested in the Grow Your Own challenge check it out here! It seems really fun and I love seeing what other people are growing in their gardens and making with it! I'm trying to catch up with your blog - have had some sick little ones at home. Looks like you have been quite busy lately. I love the art bins and prep you have done and I always love your market posts. Your spread looks amazing! Glad your day ended up better, looks like the children had fun! Oh, and I wanted to grab that pesto sandwich and eat it! Looks delish! You could also try raw walnuts, which I find quite tasty! Oh delicious! This is perfect for the season. Thanks for sharing again with Grow Your Own!